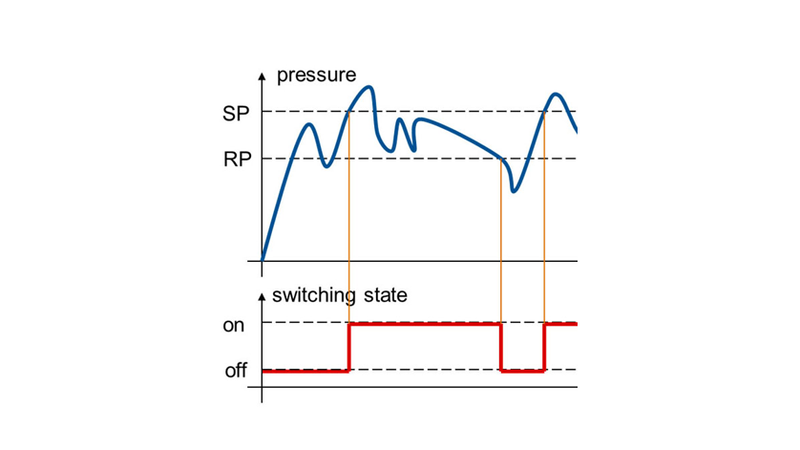 The hysteresis switching function is generally included for all switch variants, whether mechanical or electronic, and whether for the parameter of pressure, temperature, level or flow. 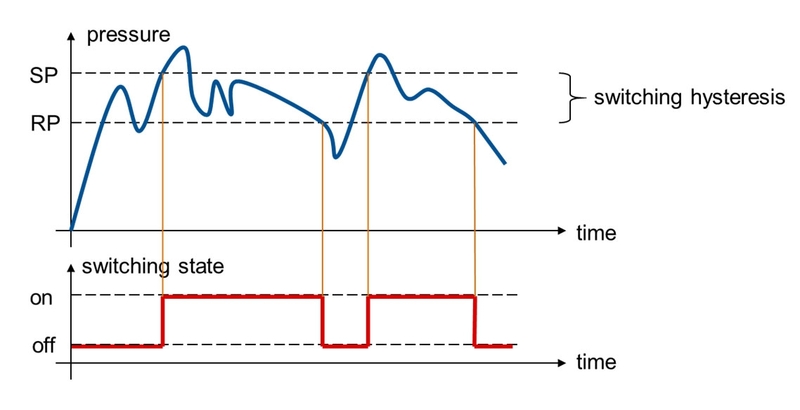 Hysteresis is generally understood to be the difference between the switch point and the reset point. In the case of mechanical switches, the hysteresis is usually predefined by the manufacturer, while in the case of electronic switches it is often configurable. A pressure switch is used to monitor a pump for potable water. This pressure switch should activate the switch output when a pressure of 6 bar is exceeded, and thus stop the pump. Following the pump being stopped, should the pressure then drop below 6 bar (reset point), the switch output will be deactivated once more and the pump will be restarted. If you now imagine a continuous process, then the pump will be switched on and off in quick succession (see Fig. 1). This will lead to instability, wear and, in the long run, to the early failure of the pump. So in order to avoid oscillation in the system, one needs a setting of the switch point and reset point that is adapted to the process, i.e. a defined hysteresis to enable a stable control loop (see Fig. 2). Mechanical switches, due to their design, have a predefined hysteresis, which can be found in the manufacturer’s specification. This is usually 10-20 % of the set switch point (e.g. 10 bar switch point -> reset point at approx. 9 bar -> 1 bar hysteresis). In an electronic switch, hysteresis is usually fully configurable over almost the entire measuring range – through external software, a configuration module or an integrated display with control buttons. 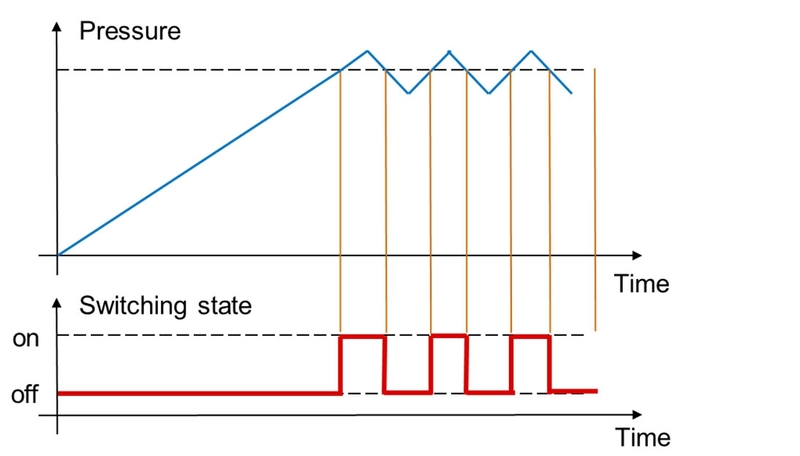 In a variety of applications, (pressure) switches perform a safety function and often serve as the redundant monitoring of a critical threshold value. Hysteresis is the most widely used switching function in industrial applications, due to its ease of application and for mechanical switches, it is the only possible switching function. These days, the switching function of ‘window’ is also often found in specific applications, but this is only usable within electronic switches. A detailed explanation of the difference between ‘hysteresis’ and ‘window’ can be found here. Your contact person will be glad to help you with the selection of an appropriate pressure switch.